Mary Rapley from Shipley, Sussex, arrived in Sydney at the end of August 1838. A ‘nursery girl’ by calling, she had been convicted of shoplifting at the Sussex Quarter Sessions on 7 January and sentenced to seven years. Mary was one of 172 female convicts to arrive on the John Renwick, having left the Downs, off the Kent coast, in late May. Mary was single, Protestant and aged twenty-four. She could read but not write. Mary’s convict indent described her as being 4 foot 10 1/2 inches tall, with brown hair and hazel eyes. Her complexion was ‘fair, ruddy and freckled’, and she was missing one of her front upper teeth. Mary became an assigned servant to James Henry, in Cumberland Street in the Rocks, but within a year of her arrival in New South Wales she had married. Her new husband, James Tim (or Jim), aged 27 in 1839, was Chinese – one of a very small number of Chinese men in the colony at the time. In late July 1839, Mary and James’s marriage banns were published at the Scots Church, Sydney, where they were wed by the Rev. William McIntyre on Friday, 9 August. Neither Mary and nor James could sign their name, and so made their mark in the marriage register with an X. Mary’s employer, James Henry, had consented to her marriage, but the couple had not applied for permission from the Governor, which was usually required if either the bride or groom were still serving their sentence. Yesterday a Chinese gentleman named James Tame, appeared before Captain Innes at the Police-office, to complain of his wife, an English woman, whose maiden name had been Mary Rapsey, for running from his protection to that of another person. Upon stepping into the witness box, Mr Tame stated himself to be a Chinese catechist in his own coountry, that he was of the Roman Catholic persuasion, and was converted by the Portuguese. He said that he read the bible and believed that he read, but would rather be sworn on a saucer which was the way he had been accustomed to. He had been married by agreement with the prisoner, who had been an assigned servant to a person named James Henry, in Cumberland-street. They were married by the Rev. Mr McIntyre, and had been united but twenty-five days when the lady left her lord for the protection of another. Captain Innes said, that this case required investigation as he could not understand how permission had been obtained for the marriage, and he conveived that there had been some irregularity in the matter. The prisoner was remanded until enquiry should be made. So many interesting things to think about in their story! When and why had James come to New South Wales? Was he from Macau? If he was a Catholic catechist in his own country, what did he do in Sydney? How had he and Mary met? In what circumstances had they married? Who was Mary’s paramour and was she compelled to return to her husband? I have had trouble finding any further reference to Mary or her Chinese husband after this hearing before Captain Innes in September 1839. All the references to the surname ‘Rapley’ (or similar) I located in the convict indexes at State Records NSW are to Mary’s uncle, Daniel Rapley, who was sent to New South Wales in 1818. I also didn’t find any references to the surname Jim or Tim or Tame (or similar). And I can find no further Trove or BDM references either. Any clues or further information would be very welcome! ‘Conversion and perversion’, The Australian, 24 September 1839, p. 2, <http://nla.gov.au/nla.news-article36861109>. 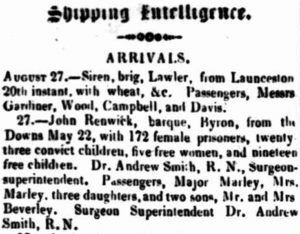 ‘News of the day’, Sydney Monitor and Commercial Advertiser, 27 September 1839, p. 2 (morning edition), <http://nla.gov.au/nla.news-article32165693>. NSW BDM 526/1839 V1839526 73A, marriage of James Jim and Mary Rapley, Scots Church, Sydney. 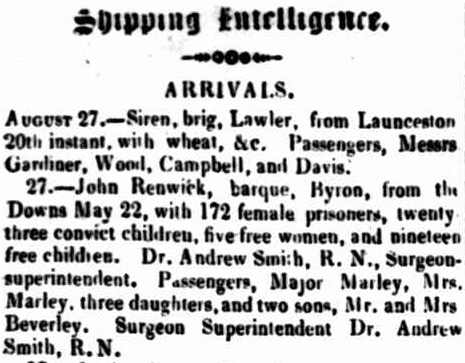 ‘Shipping intelligence’, The Colonist, 29 August 1838, p. 2, <http://nla.gov.au/nla.news-article31721608>. SRNSW, Reel 908, Shelf X641, NRS 12189, Annotated Printed Indents (John Renwick, arr. 31 August 1838). 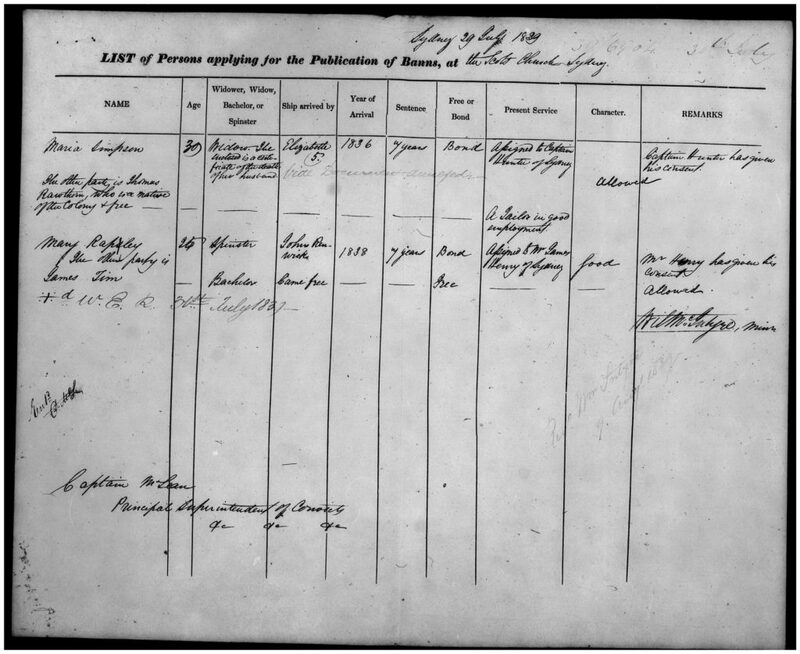 SRNSW, Reel 5027, NRS 12937, Registers of Baptisms, Marriages and Burials, 1787–1856, vol. 73.